So my normal yearly pledge to blog more often is yet again broken. However you still get the trusty yearly update. So 2013… It went fast, It was fun and much has changed. In early January I was commissioned to make some new images for The Monster Ceilidh Band for there up and coming album and for general publicity. My love of a mono silhouette is once again put to use on the band. In mid-January I started getting ready for a trip to the arctic along with a bunch of nutter togs! 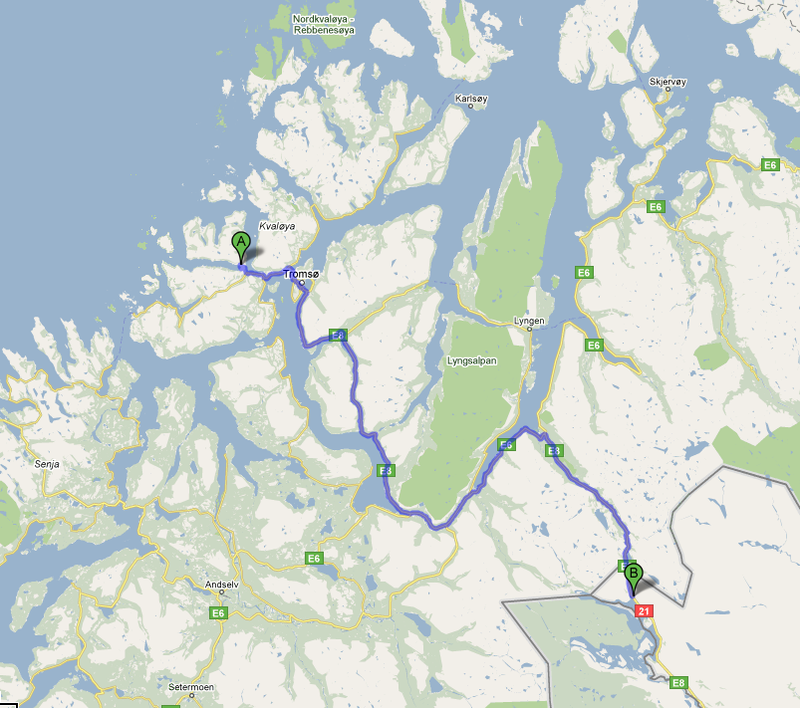 This trip would be slightly more epic than others with thousands of snow-covered miles driven over 14 days. We travelled though Sweden, Finland, Norway and back again. 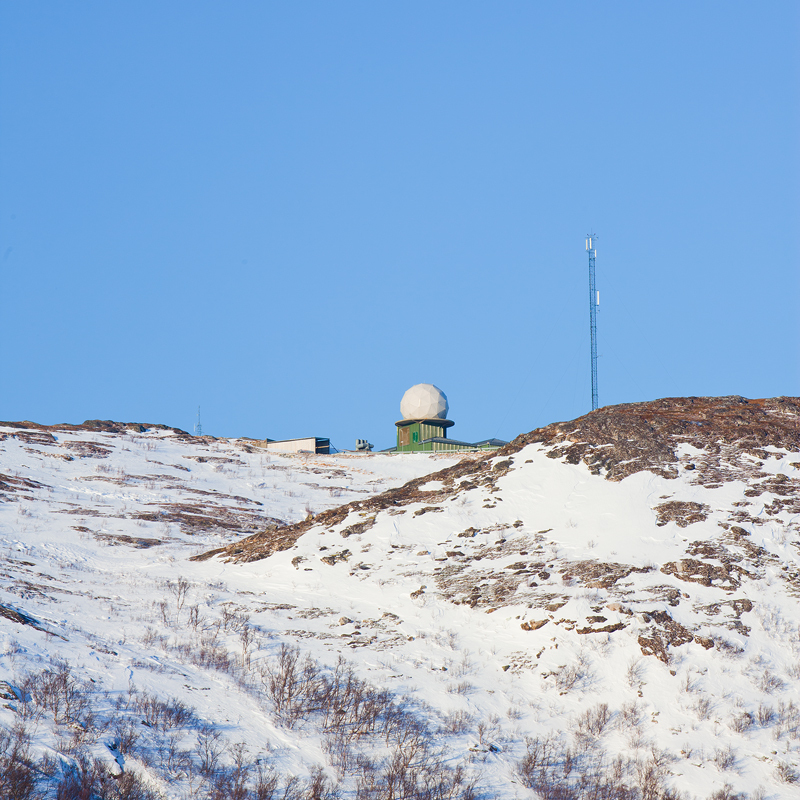 Temperatures ranged from + 3 degrees to -38.5 c ! It was hard at times but the sheer beauty of snow covered Scandinavia and getting to briefly witness the Northern lights made the trip worth the expense and effort. On my return it took me many months to even look at the images. I remember when on location, being very disappointed in not being able to convey the beauty of the surroundings into the camera. This is often the case, sometimes the buffer of time is needed to know if you have succeeded. I used a GPS tracker on my iPhone to capture the silly route. Moving on, literally lots of moving! In 2013 I thought it would be a great idea to move business premises and home over the space of 7 days. It all worked out ok in the end, maybe next time I will not choose to do both at the same time. We moved out of Newcastle city centre to the small and beautiful village of Hedley On The Hill in Northumberland. We have probably one of the best local pubs / restaurants called The Feathers Inn and we are surrounded by beautiful countryside. And it only takes 20 mins to get to my new Office on Team Valley Trading Estate, Gateshead. It was almost a no brainer. Saying that we still haven’t had any heavy snow fall this year so I might have a different opinion when we do. The 2013 BBQ season was excellent! Getting used to cooking on the AGA has been one of 2013 highlights. For Jennifer’s birthday there was a request for a Kitten but not your normal Tom cat it had to be a Birman. We went to meet the new member of the family around 1 month before we would get to take him home. One wasn’t enough, Teddy need some bromance so we decided to get his brother Indigo Tiger too. Check out my Instagram feed for almost daily kitten updates! The bulk of my year hasn’t really been photography. It takes a back seat as my Audio Visual rental / Production company Ingramsounds continues to grow. Ingramsounds continues to be the preferred supplier of Audio system for Durham Cathedral. Fantastic lighting by Vortex Lighting. It was a pleasure to work with the team at Vamos! festival in 2013 and looking forward to the 2014 program of events. This years Durham Book Festival Production was one of the best yet with the addition of the Book Case set designed by the team at Ingramsounds and built by Mike Brown at Durham Scenic Workshops. Since moving to the Northeast 7 years ago I heard a rumour about the Victoria Tunnels underneath the streets of Newcastle Upon Tyne. In 2013 Ingramsounds supplied lighting for Unit 44’s first, “Into The Dark” art exhibition inside the Victoria Tunnels. It was a fantastic day and a great experience. After running hundreds of meters of power cable and installing the lights for the exhibition there was still time to make some images. In 2013 Ingramsounds started suppling retro style festoon lighting systems to be used for events, weddings and installations. We now stock a wide range of incandescent filament lamps and festoon harness, in the age of LED everything these lamps offer a vintage looking alternative. Have you ever needed an app that can create tones from 20Hz to 20KHz ? Well now you can with the Ingramsounds Oscillator available from the apps store. Simon Athey and myself set out to create a easy to use app for testing speakers, it also has a fun side too. Download it and let us know what you think? Myself & Jennifer had a wonderful night away in the Lake District visiting friends. I only took a handful of images but this one from Coniston was a 2013 favourite. At least once a year I travel to the west of Scotland to photograph many aspects of Barr LTD business. Below are a selection of images taken from the renewable, environmental and quarry aspects. Harestanes wind farm near completion. Dan Bye asked me to photograph his new show “How to Occupy an Oil Rig” days before it was heading up to the Edinburgh festival. The set was made out of large Lego bricks so I was very excited! Below is one of the promo images I made. One big highlight of the summer was being offered the chance to go flying with my friend Sam, I instantly replied yes and jumped in the car with my camera gear and headed to Teesside airport for this mini adventure. My 2 shortlisted images both can be purchased from my web site. They also appear in the 2012 APOTY book. In late October Jennifer and myself took a short break to Sorrento, Italy. It was such a wonderful trip, we got very lucky with such amazing weather especially since it was the last week of the season. We explored Pompeii, Herculaneum, Capri and we did the stunning Amalfi drive and stopped off at Positano for an ice-cream. Sorrento was beautiful, I would fully recommend to anyone who wants an interesting break. Especially to any coffee lover! Looking back on 2012 and all things considered its been a pretty fantastic year! This year I managed to spend nearly 2 months of the year in California, travelled over 60 thousand miles around the world & filled 2x 1TB Drives with data. And make my way on to Live BBC news 24! Below are some highlights of 2012. Lets kick things off with a short documentary made by the BBC for Inside Out about my Aurora Chasing in January. 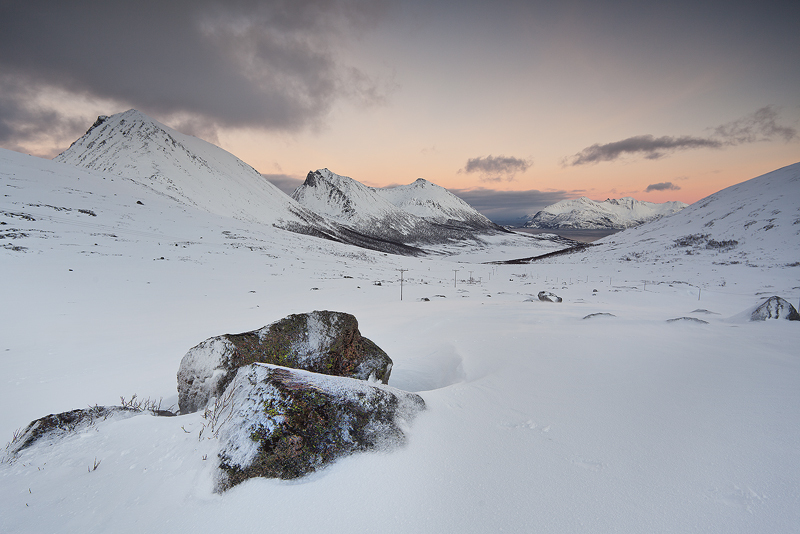 Here is one of the final images from 22nd January. Its also available as a edition print from my website. The Second Highlight was traveling to Los Angeles to work on the sound department for “The Amazing Spiderman” movie. It was Kinda a big deal! While I was in Los Angeles I met up with my good friend & shoe designer Jerome C Rousseau. to make some new promo images. The Images appeared in many top fashion magazines such as Vogue +Elle along side his wonderful shoes. A quick trip to the JL Studio was made to take a portrait of my good friend Jack Lowe to use along side his new projects. March was crazy busy! I managed to fly to Switzerland to work with a great act called Frisky & Mannish I stayed in a Chalet in Verbier Village, Amazing! Sadly no photos where taken on my SLR but I did get a quick one on the iPhone. It really was a flying visit! I was back in England in under 24 hours! April & May saw me heading back out with what I like to call “my band” I don’t actually play an instrument I just push faders at the correct time and do some driving & lifting. We made some fun movies “backstage passes” in many of the UK’s dressing rooms & gardens. At the end of May I returned to Los Angeles to complete “The Amazing Spiderman ” job. I managed to get some LA party time too! LA Hot Tub Saxophone Party Time! At the end of April my new Reed Ingram Weir Photography website went live with new web shop & design. Thank you to my good friend Mikey over at heymyshko who worked hard on this. June / July passed very fast with my AV company Ingramsounds providing production services for Durham Brass Festival , EAT Festival & Vamos! In Early August myself & good friend and fellow photographer / film maker Topher Mcgrillis made a short teaser video for November Club. I personally wasn’t keen on the final edit of the video so we edited our own horror version to please ourselves. At the End of August I travelled back to California for the 3rd time in 2012 but this time it was leisure and with my better half Jennifer. We would be embarking in an epic road trip from Los Angeles and passing though, Malibu, Santa Barbra, Moro Bay, Carmel, Yosemite, then flying home from San Francisco. We stopped in with my friend Daniel Auber to make some images for an El Decor feature. The next day we left LA and started traveling North after a visit to Universal Studios. Still unsure what the funniest part of this image is? Me or the kid next to me. You guessed it! Not a bad spot for a proposal. Incase you wondered… She said yes! Tunnel View Yosemite National Park. 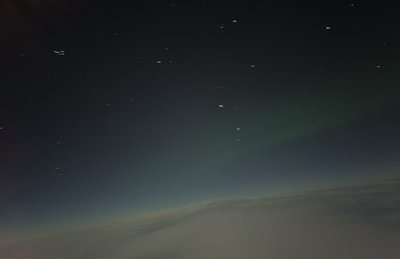 A Surprise but very beautiful show of the Northern Lights flying over Canada on the way back to the UK. Everyone else was sleeping but we got a great show on the way to Planet Krypton! Life was crazy on our return with a busy work schedule and moving into new Studio space. I was also panning the AV production for Durham book festival and getting ready for the Autumn tour with Karine Polwart. I was lucky enough to have yet another new toy to use. The Town Hall ready for a weekend of book talks with such authors & guests as Nick Robinson, Chris Mullin, Jack Straw, Kate Mosse and many more. The New Toy. Midas Pro 1 pre show at the Union Chapel for the Karine Polwart concert in October. Hungover Karine Polwart Band the morning after. Towards the end of the year I managed to try and get back out and photograph some local landscapes around the North East as well as completing some photography for my friend Peter Tickell who is currently touring with Sting. Rock N Roll Peter on the Northumberland Coast. As you might of gathered its been a busy and varied year. If 2013 is anything like 2012 I will be very satisfied. On a final note about the year, It really wouldn’t of been as special without my Jennifer. 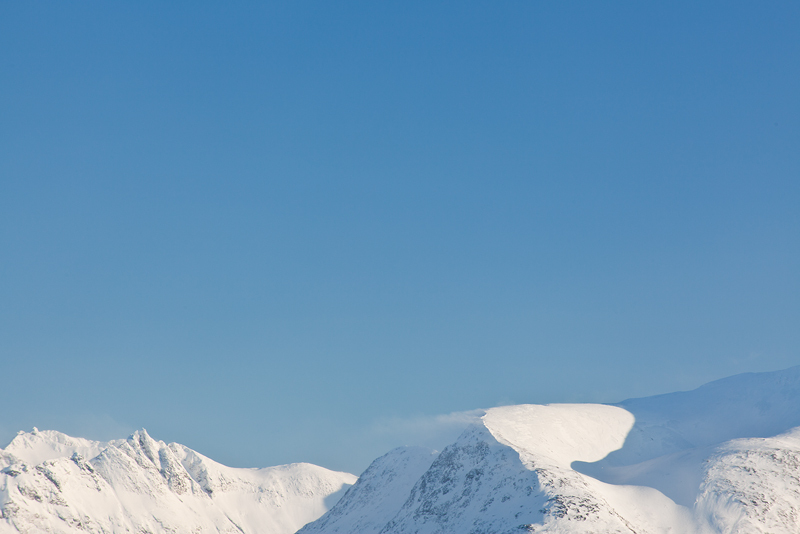 At long last and with much help from my good friend Mike J Hadfield AKA Myshko over at volicol My new website is ready to go live! It has been a long drawn out process for me as I am fussy bugger & very indecisive about things especially when it comes to how I present my work to the world. Thank god Myshko is a patient man! Below is a screen shot of the home page click on it and you can browse around the thing for real. Maybe buy a print on the new online store completely custom designed & made by Mikey feel free to drop me an email via the new contact section and please let me know your thoughts on the new site. I also want to say a big thank you in advance to Jack Lowe who will be hand making the prints with love and care. 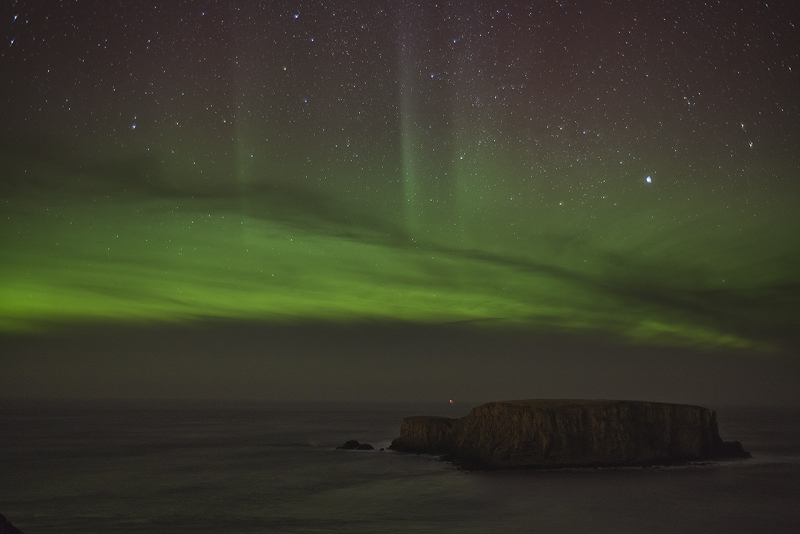 I have been über busy in recent months and have much to blog about such as my fantastic viewing of the Northern Lights from Northumberland back in January and some very exciting work carried out across the pond in Los Angeles back in February. I have also been involved in many exciting projects with my other business Ingramsounds as well as starting the UK Spring tour with Karine Polwart Trio. After the long bright summer skies, we finally have darkness again and with the increased solar activity, it was only a matter of time before the Northern Lights would return to Northumberland. 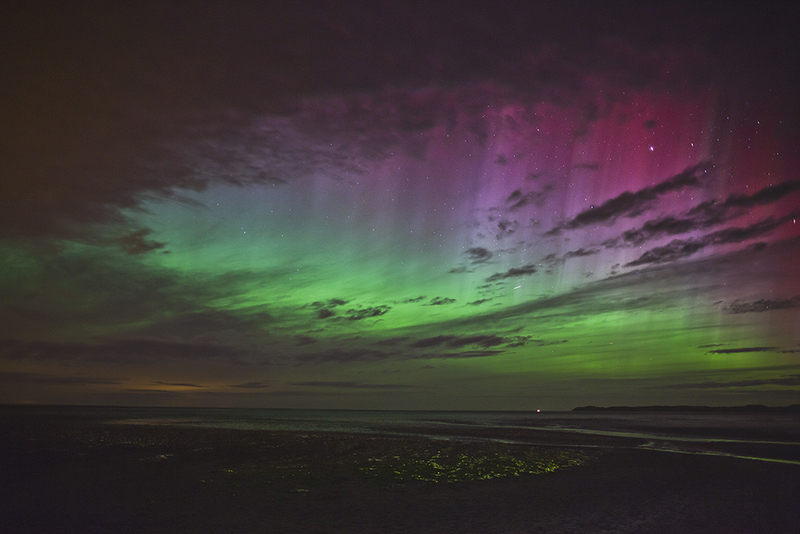 This wasn’t the first time I’d seen the Northern Lights from Northumberland. 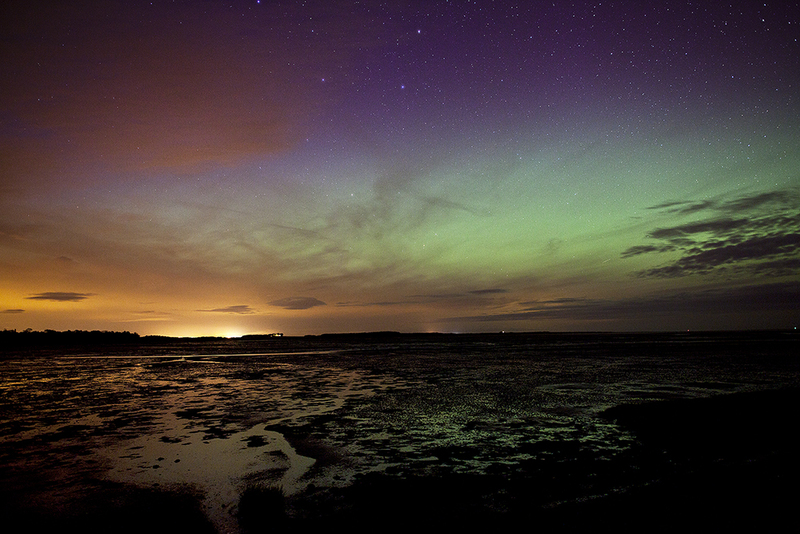 I photographed the Aurora back on the 10th March 2011 at Lindisfarne, not long after my amazing Irish Aurora experience. This time things were just slightly more fun with the addition of the Aurora-chasing convertible warp ship. It can transport two persons and camera equipment at high warp. 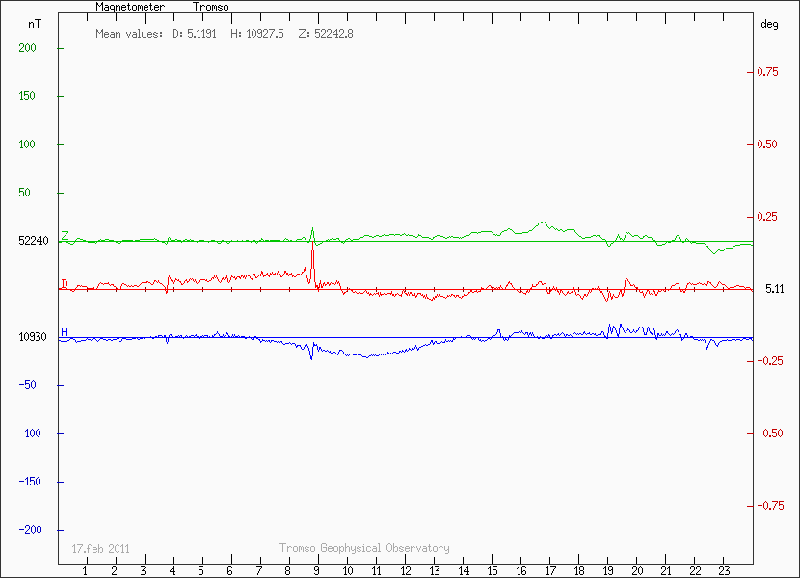 I was aware there might be a possiblity of a severe geomagnetic storm following three CME eruptions from the Sun. But it wasn’t until around 17:00 that evening I really fully believed that there would be a chance of viewing the Northern Lights from the Northeast. I checked all my available data and everything added up so I called my co-pilot, friend and colleague Patrick Hussey, and we launched the Aurora Ship up the A1 at high speed (within the legal limit, of course). I decided to head for a place called Howick to do the first check and see if we had any Aurora in the sky. As soon as we pulled up, the sky to the North was bright with a tint of green but we had heavy cloud obstructing the view. I set the camera up on a tripod and took an exposure of around 8 seconds. This confirmed the Northern Lights were out to play. We got straight back in the Aurora Ship and headed further north. 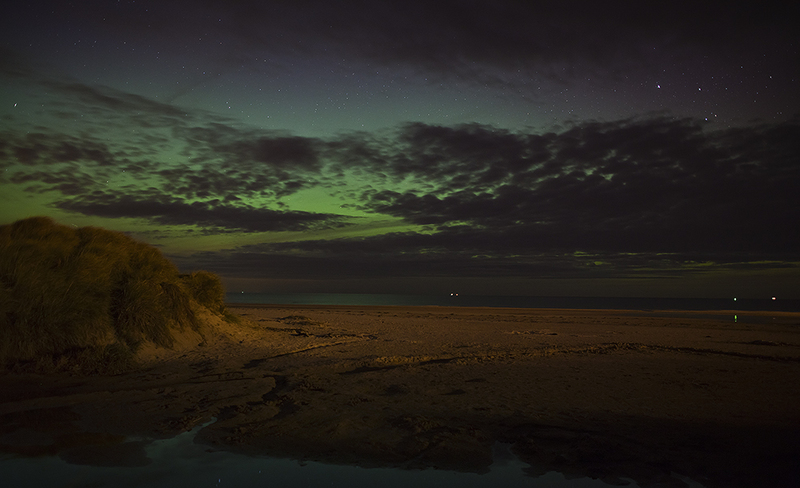 We pulled up at Bamburgh despite the large amount of light pollution from the village and castle, the Aurora was building in strength and structure, so it was well worth a few photographs before setting off to the next location. The next stop was just slightly further North at Budle Bay. 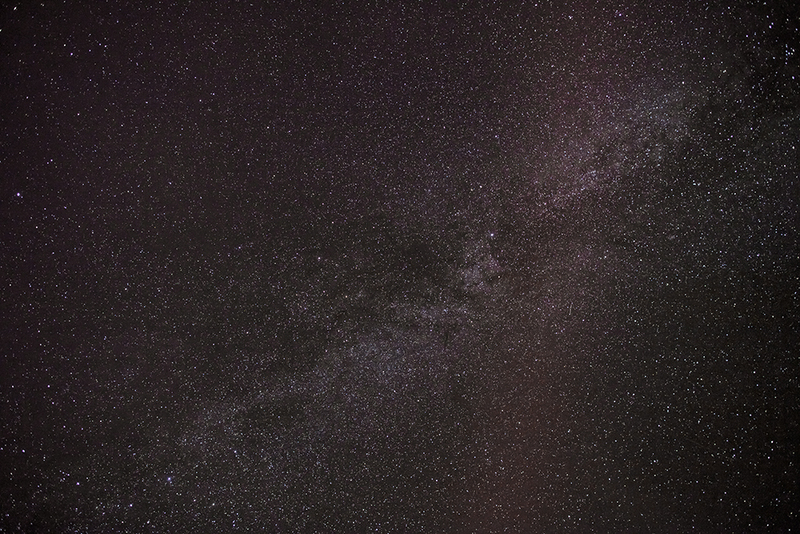 The light pollution was much more under control, we could even see the Milky Way! The Milky Way with some added lens flare supplied by the Aurora Ship's particle sensors. 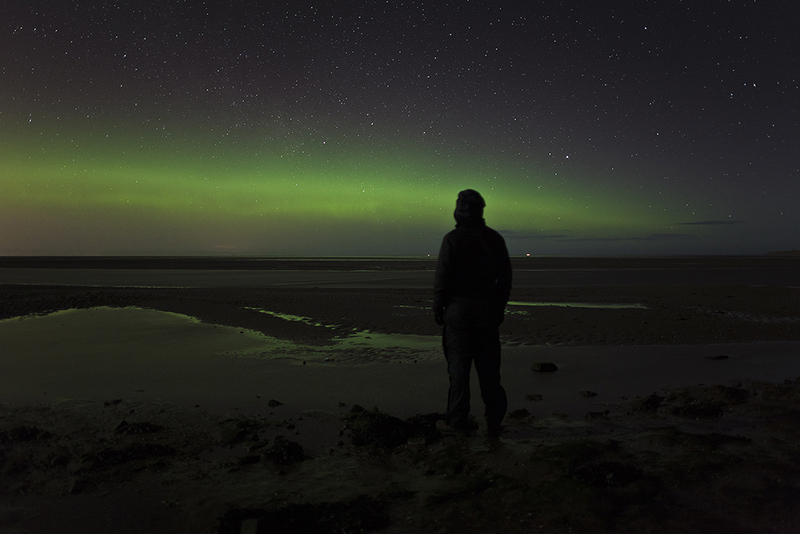 After viewing the Aurora here for around 20 minutes, I decided we needed a clear view North and the best and closest place for that is Lindisfarne Causeway. After a cracking little flight in the Aurora Ship, we arrived not knowing where the tide would be. Amazingly, the tide was out so we had a safe crossing to Holy Island. We parked up about halfway across the Causeway and set up the camera. 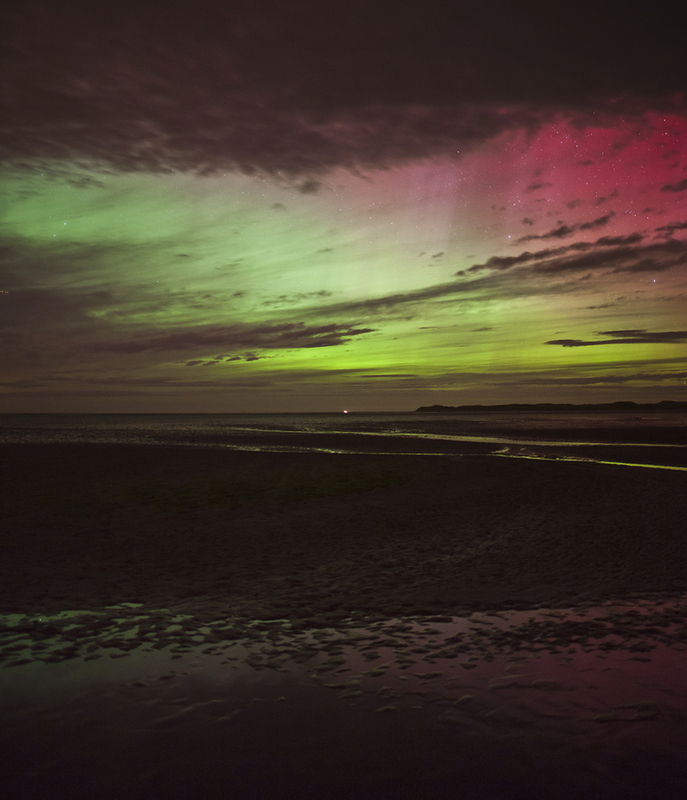 By now the Aurora was very bright and clearly visible with structure and an array of colours. I took some comedy photographs of the Aurora Ship but while doing this, the sky ignited. What was already bright visible Aurora became insane with large curtains of light falling from the sky! It was quite a sight to see such a display from Northumberland and I was so happy I had followed my heart and belief that we would see the lights that night. The insane display didn’t last long, probably only 5 minutes, before it settled and faded away to just a slight green hum in the sky. As it’s quite rare to have such powerful displays of the Northern Lights in England, my images were published by major UK papers including The Sun, The Mirror, The Daily Mail, The Telegraph, and online publications including Spaceweather & National Geographic. I will be taking my images to Jack Lowe Studio were he will be making a series of fine prints that will be available to purchase on my new website. It should be live over the next few months. In the meantime, should you want to order a print or talk about licensing, please contact me direct. If you live in the North East and want the chance to see the Aurora, feel free to follow me on twitter and check now and again. If it’s happening I will be talking / tweeting about it. If you haven’t seen part one click here, if you have please read on. The day before departing for the second Norway trip in February there was a huge earth directed M class solar flare. Also on the day of departure there was an even bigger X class flare the first of the new solar cycle to boot! So the conditions could not have been any better with clear sky’s forecast for the duration of the trip. I have to say I was very excited indeed! One of the things I always remembered at the end of January Norway trip was don’t worry you’re coming back in 2 weeks so you can get your epic Aurora photographs then. It really looked like this was going to happen. 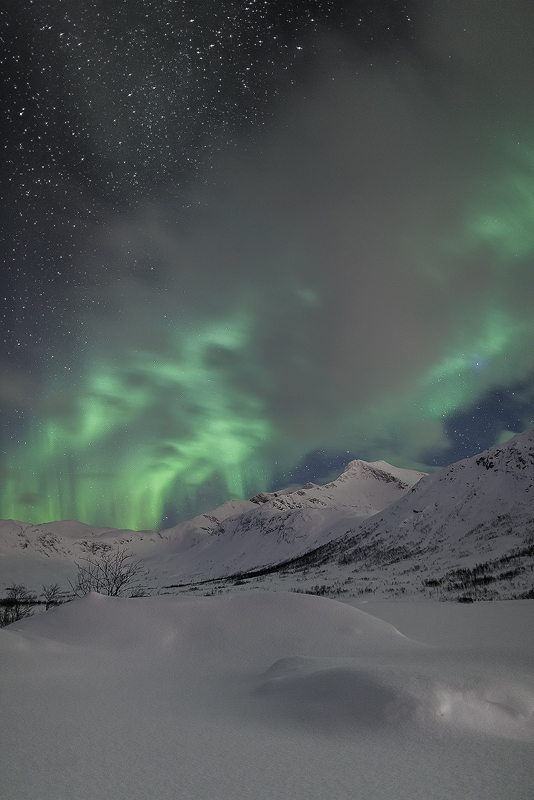 The night before we arrived in Tromsø there had been some truly breathtaking displays of Aurora, probably the effect of the M Class flare slamming into Earths magnetic field. 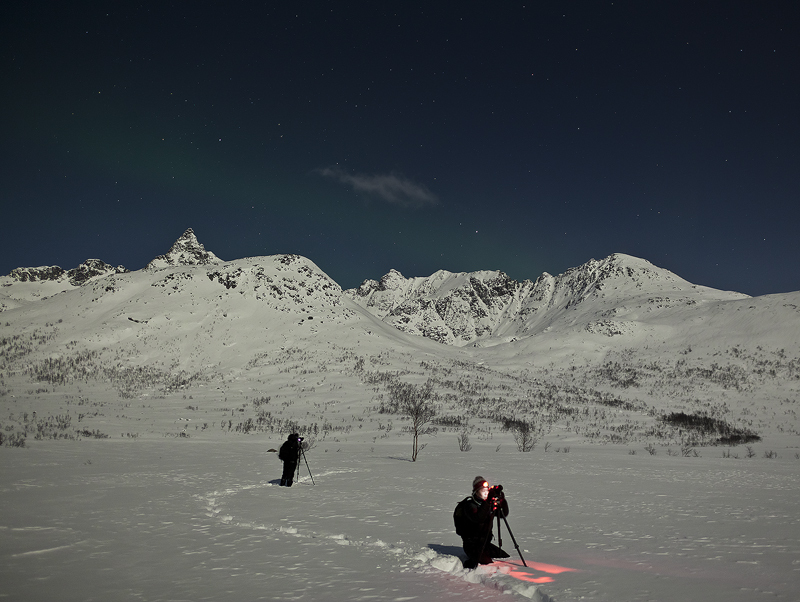 We arrived in Tromsø in the early hours of the 16th February we saw some very light low power Aurora on the flight from Gatwick we all had our fingers crossed the X class wasn’t going to hit until we arrived and were in the right place to photograph it. 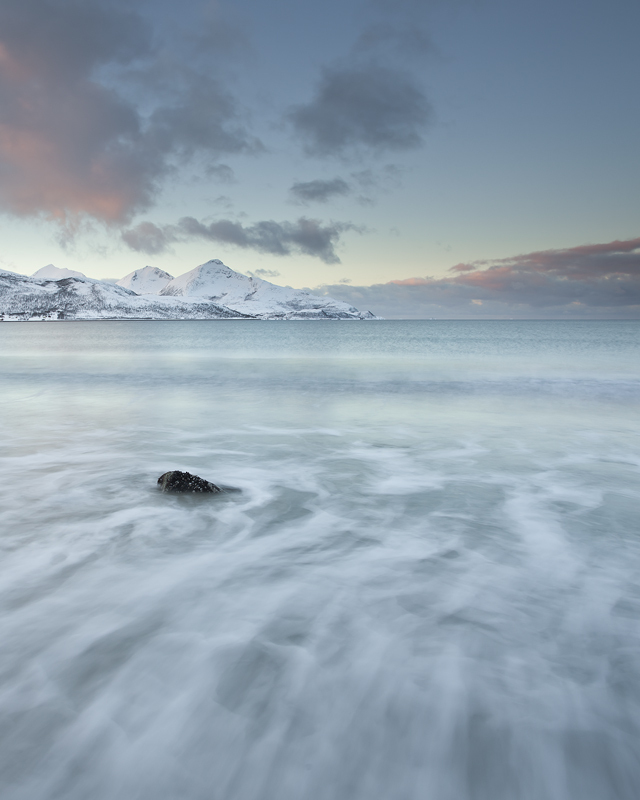 We drove straight to the cabin at Sommarøy and got some sleep and awoke early for sunrise. One thing that was very noticeable was the very high fast wind and with temperature around -5 /-10, when the wind hit your face it really took your breath away! The clear sky produced some harsh lighting conditions but looking back on the images I wish I had made more effort because the gradients in the clear blue sky were stunning. Photography feels like very hard work when getting battered by the wind so technically and physically I found it very challenging. After the windswept harsh sunrise we explored possible locations to photograph the Aurora with some shelter from the extreme wind! Antony AKA Captain Aurora / Mr Epic found a great location near Kattfjordvatnet and we planned to go back that evening. The charts and graphs showed little or no activity but we all knew this could change and go off the scale if the X class hit. We went out that evening with some high hopes. The news of the CME had even made it onto the BBC website and news channel, I was receiving texts and emails from back home with people speculating that it might be able to be viewed all the way from the North of England. 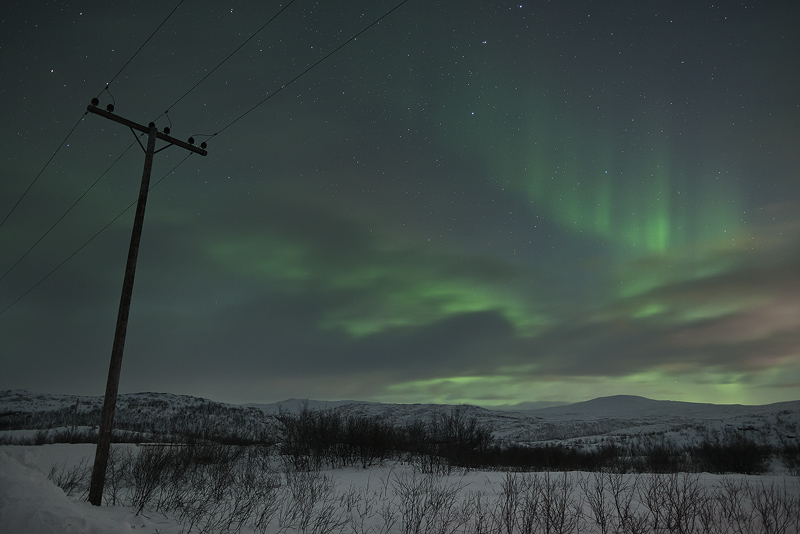 That evening we sat in the car, waited and waited and saw very little of the Aurora Borealis. Pretty much the same thing happened the following night with the levels remaining at nearly zero. I was starting to think someone had made up this whole story about the X flare or it has missed us completely. A small & very weak band of Aurora over Kattfjordvatnet Sean is looking in the right direction but I think Andy is slightly lost. 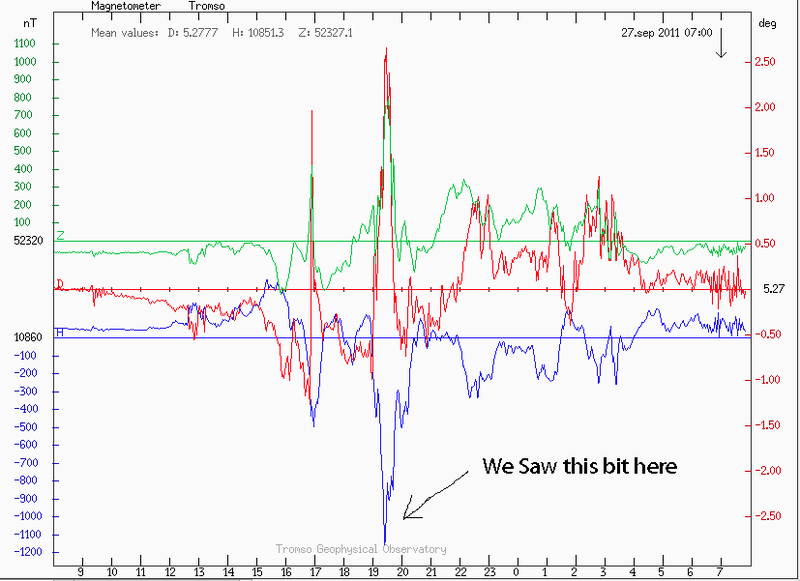 Finally on the 18/02/11, our last day, the Flare hit Earths magnetic field and sparked a G1-class geomagnetic storm, not as strong as all the hype suggested but at least it was something. As the flare hit so did the thick cloud and our view was covered up once more. There were small breaks in the cloud that prompted some short bursts of photography but nothing like we imagined it would be. After the short display we had to get to the airport and catch our flight back to the UK. The trip had been a real emotional roller coster with such high expectations, it almost felt like it was going to be a sure thing, but the fact of the matter is when chasing the Northern Lights it never is. I found that when you stop looking for something it comes and finds you. My Irish Aurora experience goes to prove that. 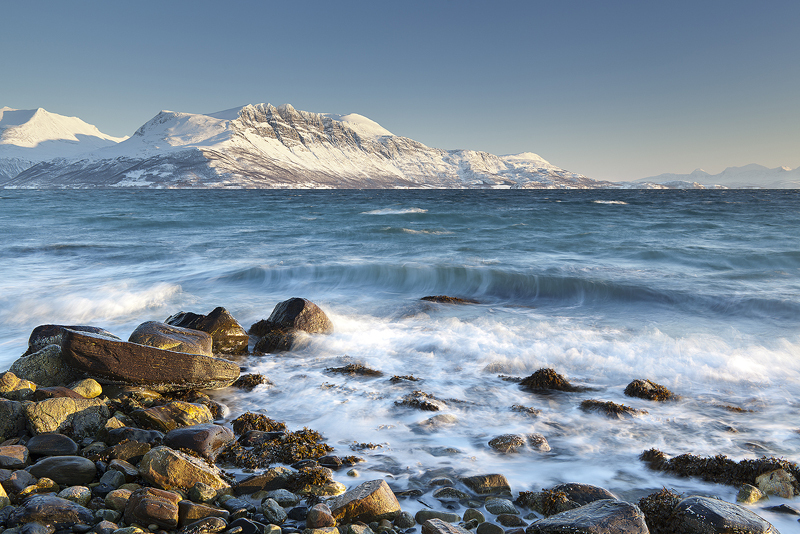 I will leave the best until last with an image made near a little place called Bakkejord. Thanks for taking the time to look at my Blog. 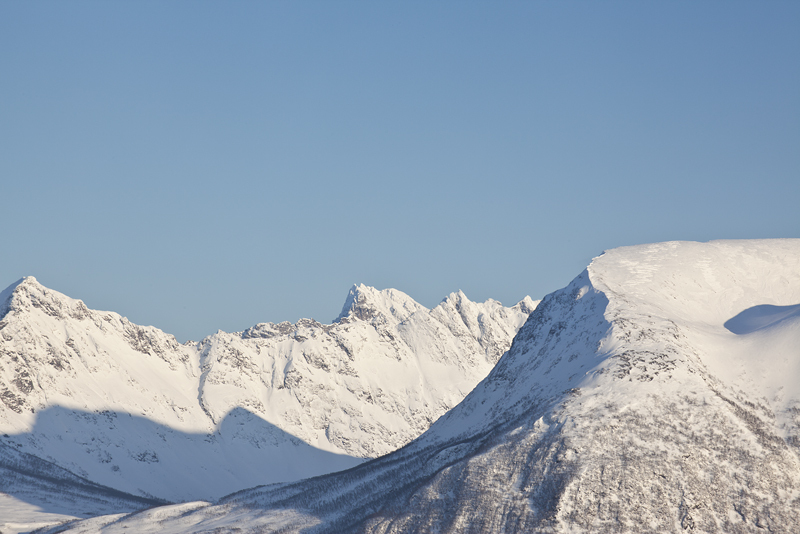 If you missed Arctic Norway Part one you can see it here. Please feel free to leave a comment or forward this link to a friend. In the first 2 months of 2011 I headed out to Tromsø Arctic Norway each time with great expectations visions and dreams of viewing and photographing the Northern Lights / Aurora Borealis in all their glory and using the short amount of day light to photograph the beautiful landscapes in this stunning area of the world. However sometimes / most of the time the elements don’t come together as you would hope. It is a frustrating thing when you are handed all the ingredients for the vision you have for a photograph in a landscape that is so beautiful but it requires that final garnish of light to make it work. For me I would rather not take a photograph than take something I know I will not be happy with later on at the viewing stage. Of course most of the time I end up taking the photograph anyway but I do try and hold back most of the time. The first couple of days on the first trip the light was excellent but I was still getting settled looking for possible compositions and just generally adjusting the the climate and sleeping patterns so not many photographs were taken, The Aurora levels were also low / non existent with a quiet sun or solar wind that had not arrived yet, When the Aurora’s did finally arrive they were covered up by the blanket of snow cloud that had followed us to Norway. Nearly 1 meter of snow must have fallen in 24 hours making photography almost impossible so a lot of sleep was had and Irish whisky was drunk. When the snow finally did decide to clear it left flat grey sky behind and then more snow came at the cycle repeated itself for a day or so. We all decided it was time to get the hell out of Norway and travel south to Finland to try and beat the cloud. It sounded like a good idea when it was suggested but it was a hell of a drive and with temperatures ranging from + 1° at the coast to – 17° inland it sure was an interesting one. The drive really was beautiful and eventful we drove past frozen Fjord’s and were followed by sea eagle’s and I even managed to get the car stuck in a ditch! When we did finally cross the Finnish border I was ready for bed and it was only 4pm, soon after the border we pulled into a large service station, the first thing I noticed was that there were only a couple of cars parked up everyone else had snowmobiles so I was instantly jealous / concerned. The great thing about Finland is that it is much cheaper than Norway so when I ordered a cup of tea and a jam doughnut I didn’t have to sell my camera equipment to pay for it. After the tea and doughnut it was time to go and find a decent location to photograph the lights. We ended up on top of this very open dark hill with a 360° view. The Aurora started to glow but I wasn’t happy with the location so I decided to go further down the road and try and find a better vantage point. I think the best action of the action actually happened when I was driving and when I did find a place to shoot it was slightly disappointing and with only a couple of average photographs taken it was time to start the long drive back to the cabin at Ersfjordbotn Norway. The next day (back in Norway) the grey cloud was still the trend and time was now ticking with our flight back to England fast approaching! I think I had only made a couple of photographs I was happy with so I was feeling pretty frustrated at this stage. I was putting lots of pressure on myself to make some decent images and I think this probably made things worse. Now when I look back over the RAW files I feel I could have done things so much better with stupid compositions and sometimes bad technique but I suppose you only learn by making your own mistakes. 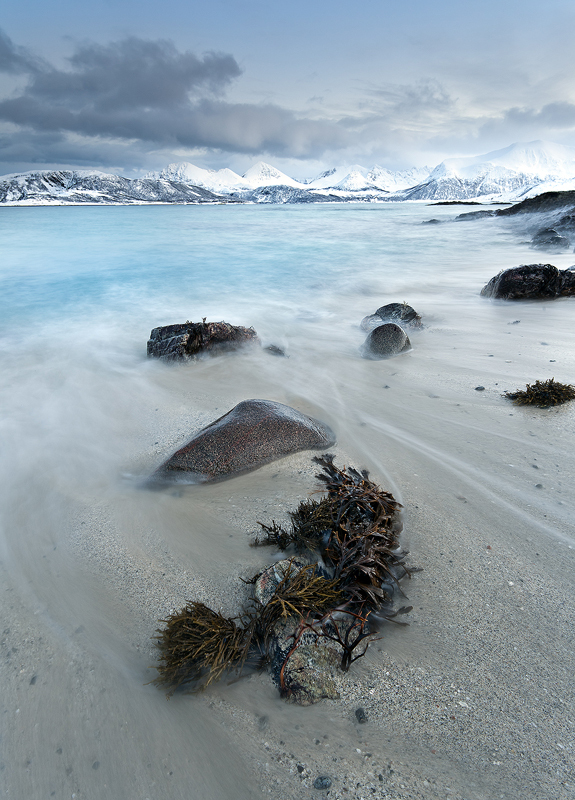 On the last day we had some good light and drove around the Island and made some images at different locations but always missing the best of the light. 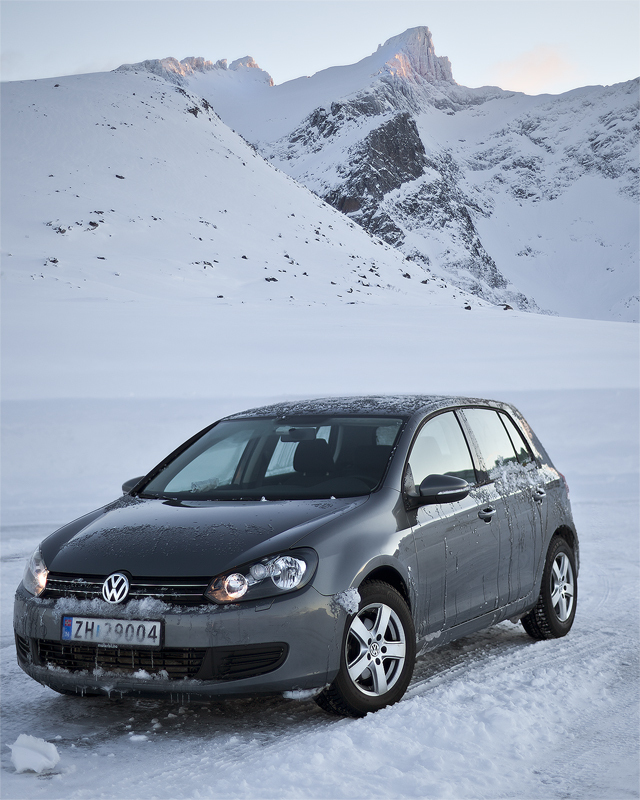 I did however get a nice shot of the hire car near Rekvik. On the final evening we finally had broken cloud, not clear sky but at least we could see the stars sometimes which is a real treat after solid snow cloud for 5 days! We decided to stay local and visit a great location only 5 minites drive from the cabin called Kattfjordvatnet, We had a pretty epic display of Aurora but it was slightly ruined with the constant attack of cloud from all directions. 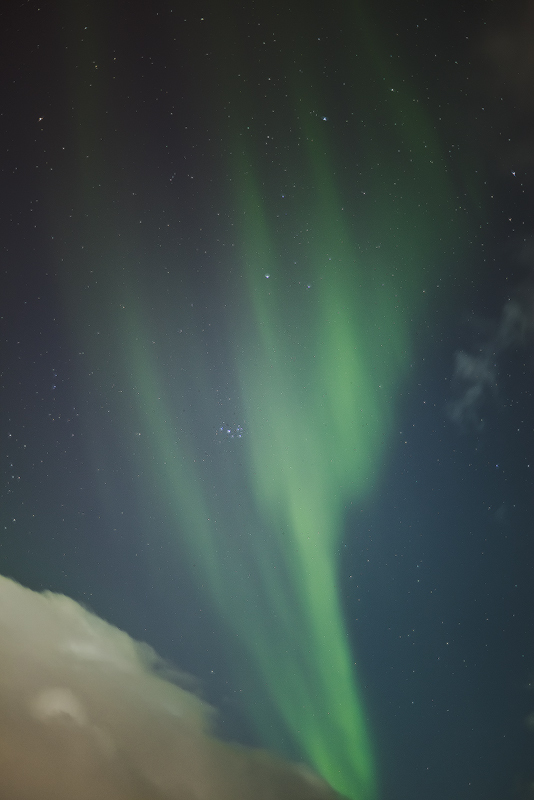 It was still fantastic to watch the Aurora dance for us, The display lasted about 1 hour before the cloud beat us. Even with all the frustration and cloud dodging, this trip to Norway was still a great experience. I learnt a lot about how to cope with disappointment and how you need to use the small moments of perfection as best you can. 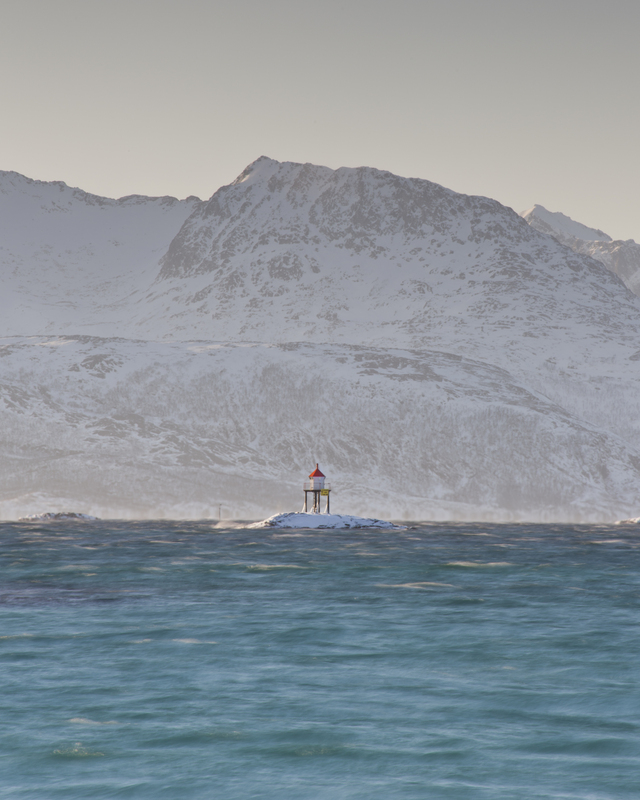 Stay tuned for Arctic Norway part 2 where I will describe my experiences of the February Trip. Until then please feel free to leave a comment. Thanks for taking the time to read my blog for further information about my work please see my website. Over the last couple of months I have been chasing the Northern Lights around the Arctic circle with minimal success but on the 1st of Mach 2011 when I stopped looking they decided to come to visit me! On the day in question I had flown to Northern Ireland to visit my Aunty and we had a great day driving out to the coast looking at the huge waves break at Portballintrae we even had an ice cream, you’re probably thinking how could you possibly improve on that day? Well I often look at various websites showing geomagnetic levels and predicted Aurora levels and after a quick check on my phone at around 4pm It looked like something strong was brewing. 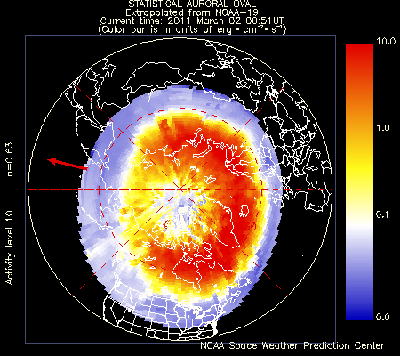 Tromsø Graph above and NOAA Aurora Doughnut below. 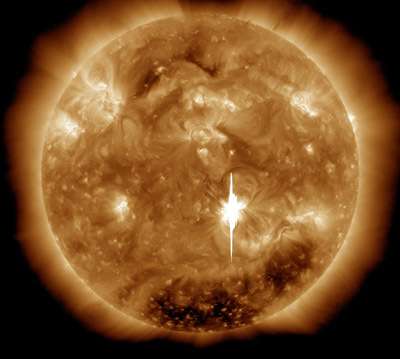 A large fast solar wind had hit earth’s magnetic field causing a geomagnetic storm that shifted the normal position of the Northern lights south. 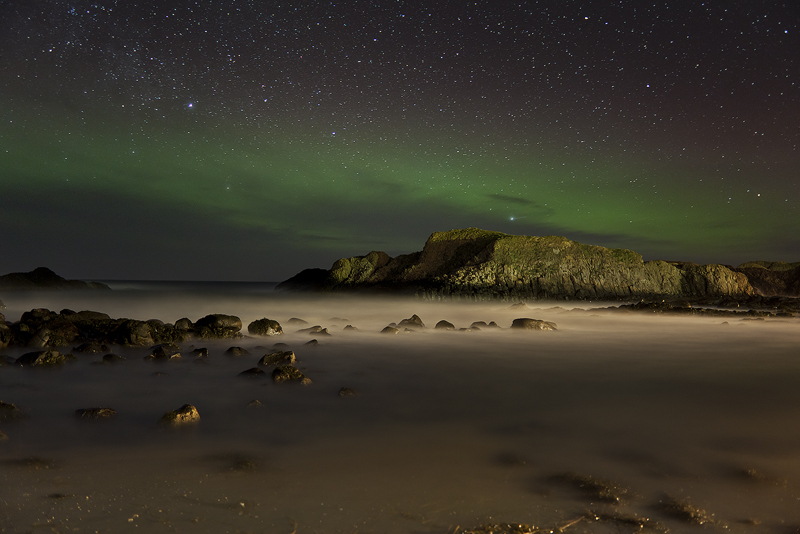 After looking over the available data I was convinced if I drove to the North coast of Ireland I would be sure to see the Northern Lights weather permitting. 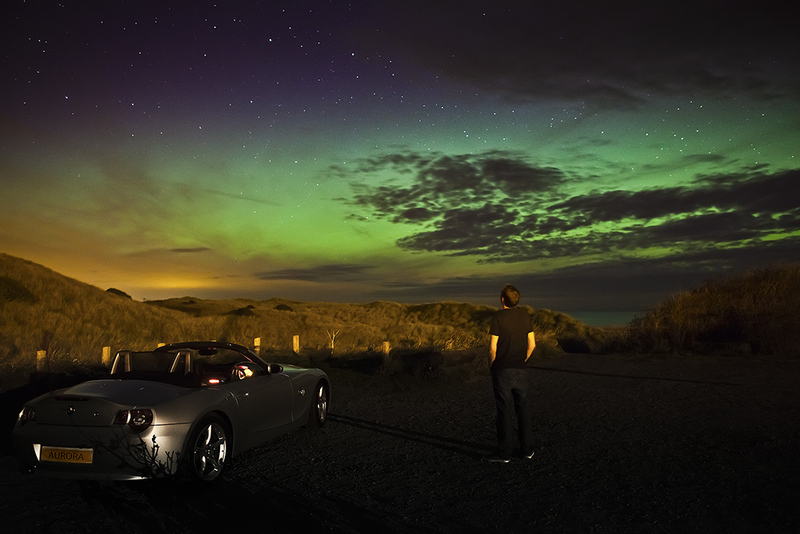 I asked my Aunty if I could borrow the car and she agreed reluctantly as I think she thought I was a crazy person suggesting that I was going to photograph the Northern Lights in Ireland. 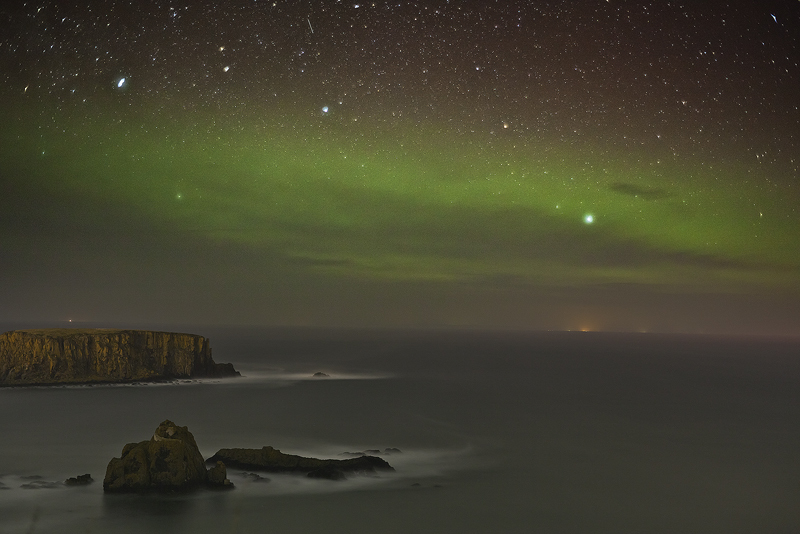 When I reached Ballycastle I decided there was way too much light pollution from the Harbour so drove west along the Causeway Coastal road until I reached Carrick-a-Rede Rope Bridge car park. 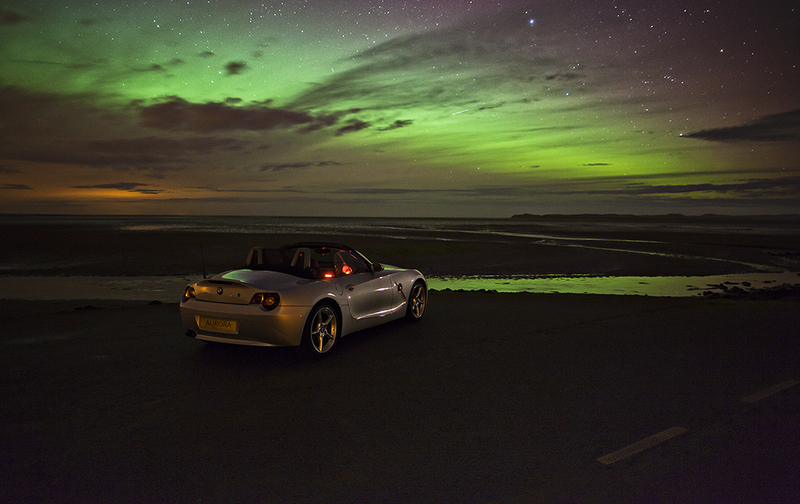 I parked up and jumped out of the car with excitement and there it was glowing bright about 35° above the horizon. When my eyes adjusted from the complete darkness I spotted Sheep Island and included this in most of the photographs from this location. Exposure was a complete nightmare all my photographs are totally under exposed due to the 8% moon that wasn’t even in the sky and zero light pollution, the only real light source was the light house on Rathlin Island. another problem I had was the fastest lens I had with me was a Ziess 50mm f/1.4 so in any exposures over 10 seconds the stars would move very noticeably. Even with a 30second exposure @ f/1.4 at ISO 1600 the images were still coming out dark. so I just had to balance the settings as best I could. I knew I wasn’t going to make a masterpiece but I was committed to recording this moment in time to the best of my ability. I stayed at Carrick-a-Rede for about an hour before driving down to Ballintoy and having ago there but it was hard going with the horrible yellow lights so I decided to call it a night still feeling amazed I had even seen them at all! or you could always follow me on Twitter @reedingram as if the Aurora is out in strength I will probably be talking about it!